Two men took jewelry and cash from the rapper in New York on Sunday. On Sunday it was reported that 6ix9ine was kidnapped, robbed, and pistol-whipped in Brooklyn. However, while police reports corroborate the complaint, the rapper's version of events on the night varies considerably when compared to the version he provided authorities. The initial report, given to TMZ by sources close to the rapper, stated that the 22-year-old pulled into his driveway where three armed men blocked his path and knocked him unconscious. It was then claimed that he came to in the back of a moving car where the men told him that if he didn't give them money and jewelry they would kill him. The group returned to 6ix9ine's home where he handed over $750,000 worth of jewelry and around $20,000 cash. The sources close to 6ix9ine claimed that the ordeal didn't end there. The group then drove away with him still in the back seat. It was claimed that he managed to escape by jumping out of the car. He was chased but "one of the gunmen began chasing him but got scared and retreated." The rapper then contacted police and an ambulance via a passing member of the public. He was reportedly taken to a hospital to recover. However, the rapper's official police report is a little different to the dramatic events recalled above. 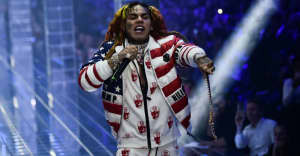 The Associated Press confirmed with the New York Police Department that 6ix9ine told them he was forced from his own car at at an intersection around 4:30 a.m. on Sunday, July 22 by two men. He was then forced into their car and made to call someone to bring an "undisclosed amount of jewelry" to the scene, which they then took. The New York Police Department says the rapper went to a police precinct early Sunday to report what happened to him. The AP adds that 6ix9ine became “uncooperative” with authorities after filing his report. Additionally, there’s no mention of the rapper seeking medical attention. The FADER has reached out for comment. The rapper had been arrested in Texas earlier in the week on charges connected to an incident in which he appeared to choke a 16-year-old boy in a Houston mall. Earlier on Sunday, 6ix9ine dropped a new single, a collaboration with Nicki Minaj called “Fefe.” Check that out below.